What the Hell Is This Weird 1958 Body Armor? These photographs depict a Detroit police officer firing a 20-inch-barrel Winchester 1897 Riot Gun at someone wearing unusual protective armor. It certainly looks like something out of 1950s science fiction. The officer appears to put several shots into the armor at close range. The armor appears to enclose the wearer — plates extend down the legs while the arms remain inside the torso section. The photograph dates from April 1958, but few other details are available. 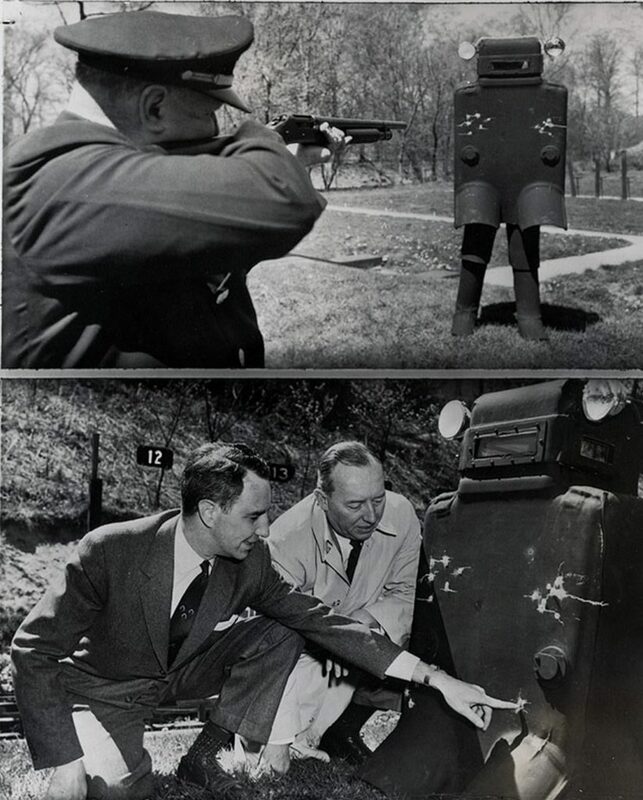 The body armor’s design is attributed to inventor Harvey S. Freeman, and it’s possible Freeman is one of the men examining the armor in one of the photographs. Sadly, I haven’t been able to find any further information on Freeman or a patent for his armor. However, I did find a mention of the armor in an edition of Mechanix Illustrated magazine. The article describes the armor as a “60-pound plastic shell” with “headlights for night cops.” A September 1958 edition of Popular Mechanics also features Freeman’s design. It notes that Freeman himself was wearing his armor during the shotgun test. “I hardly felt a thing,” Freeman told the magazine. Popular Mechanics claimed Freeman “perfected the armor from an alloy of plastic and fiber glass.” Freeman dubbed his armor “the Armadillo,” according to article. Incidentally, while searching for more information about Freeman’s armor I came across another article from a 1956 edition of Mechanix Illustrated that depicts Detroit police testing a slightly different type of body armor. The photograph accompanying the piece shows the rear of the armor as well as a wheeled armor shield. This may be an earlier iteration of Freeman’s design. It features a similar shape and set of vision slits.